Your prized possessions are no longer on the menu of pests. 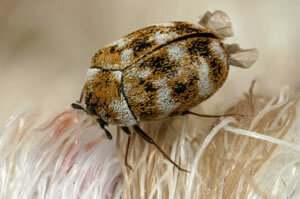 Cloth moths can be pesky invaders all year round, but they become especially active during their spring mating season. You may not even be aware that they have invaded your home since you will seldom see them as they avoid light, preferring to lurk in the dark. It is not the moths themselves that are the problem, but their hungry offspring. Moths lay eggs in dark undisturbed places to make sure that the eggs survive. One moth alone can lay between 40 and 400 eggs. The eggs hatch into very small and hard to see larvae that hide in clothing folds, furniture crevices, and rug and carpet pile. Once the larvae emerge they have insatiable appetites and their favorite meals are most likely some of your prized possessions. The moth scouts out a food source in which to lay her eggs – anything made with natural fibers such as wool, silk and feathers, even wool blends or synthetic fibers that are soiled with food stains or body oils. Primary targets are your clothing, furniture, bedding and rugs. Attractive places for moths to lay their eggs include the back of a closet filled with winter clothes that are no longer worn as the weather warms up or in a rug’s edges next to a wall or under furniture where feet are unlikely to tread. And once the eggs hatch and the larvae start to feed, they can cause considerable damage to a textile’s surface, even eating holes completely through it. Once entrenched and well fed the larvae can travel considerable distances to spin its cocoon in an undetected area to make sure the cycle continues. Therefore, the best defense against these invaders is good offense- prevention. What Can You do to Help. The best way to prevent moths from using our homes as a “dine-in buffet” is by making the food source unattractive. That means keeping cloths and furnishing clean and leaving no areas undisturbed. Inspect any used furniture, clothing or rugs before bringing them into your home. It is always a good idea to have these cleaned first too. Don’t accumulate unused clothing or rugs unless they are properly cleaned and prepared for storage. Unused clothing should be thoroughly cleaned, then stored in airtight plastic tubs or bags with a moth repellent of your choice. 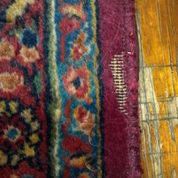 Old rugs should be cleaned, treated, and wrapped in paper or Tyvec for proper storage. Vacuum often, vacuum everywhere, along a carpet or rugs edges, under furniture, and in the closet. Vacuum your furniture and not just the surface; use crevice tool and vacuum under the cushions as moths like to eat the hair and lint that gets trapped there too. Get rid of the vacuum bag. Disturb things. Move your furniture, shake out your clothing, and expose things to light. Use moth traps that attract them and capture them so they can’t breed. If a moth problem develops and gets away from you, it is a good idea to consult a professional pest control firm to help you protect your treasured oriental, Persian or fine area rug from these destructive home invaders. 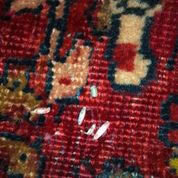 Magikist can treat your rug with a completely safe moth protectant that does not change the look or feel of your rug. This protectant makes your rug repellent to moths so they don’t stay for dinner.